Stay with us and enjoy delightful meals in the morning! Every Wednesday at Bravo Beach Resort Siargao we bring a Basque with special offers on food and drinks. Bravo Beach Resort is a beach resort on Siargao Island, located in the General Luna area; this resort is called by many as the "surfer's paradise". Here at Bravo Beach Resort Siargao, we want you to enjoy an authentic experience during your stay on the island. We offer adventure, fun, comfort, fine cuisine, and excellent service. 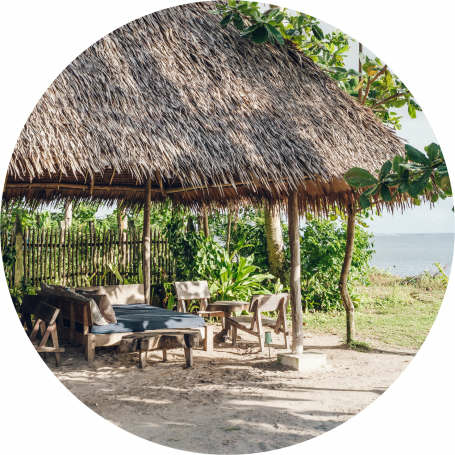 The accommodation offered at Bravo Beach Resort Siargao combines traditional Filipino construction with contemporary architecture; their fusion affords us with comfortable and attractive rooms, as functional as they are beautiful. Bravo Beach Resort Siargao is located by the beach, overlooking the Pesangan Reef and the Pacific Ocean — this gives you, our guests, the freedom to paddle out to the nearest waves, pump your kite by the garden, or just laze on the white sands of the beach just a few steps from your room! We also offer an in-house Spanish restaurant, BRAVO, that offers delicacies made by our fantastic Head Chef, David López! Siargao Island is the surf capital of the Philippines. The famous Cloud 9 reef break has been ranked amongst the Top 10 Waves To Surf In The World; despite which, it’s just one of the countless surf spots in the island. Considering Bravo Beach Resort Siargao is located close to some of the island's finest waves, we'd say we make a great choice of stay for surfers amped to hit the water!